This is the first post in a series by Cynthia Bourgeault. The second post, “Abortion, Pro-Life, and the Secular State: A Modest Proposal” was posted July 26, 2017 and the third, “When Does Life Begin?”, on August 23, 2017. Both my spirits and my hopes have been raised by the recent appearance of an important and already game-changing new article in the most recent edition of La Civiltà Cattolica. This is a prestigious Jesuit publication, whose contents are personally vetted by the Vatican Secretary of State and which can thus be seen as a bellwether if not a de facto mouthpiece for papal policy. Entitled “Evangelical Fundamentalism and Catholic Integralism in the USA: A Surprising Ecumenism“, the article is the first attempt I have seen to drive a significant intellectual wedge into the murky moral alliance between conservative Catholicism and Protestant evangelical fundamentalism that helped to catapult Donald Trump into office and is still a cornerstone of his support. The article created a well-deserved stir when it first began to circulate widely on the web during the week of July 9-16. By the end of that week internet access had been severely curtailed (presumably at the instigation of the publisher), while at the same time the remarkable analysis offered here began to catch the attention of the international news media. I am glad I printed myself out a copy before it disappeared from public sight; certainly it has already been a rich stimulus to my own creative thinking. Over the next two or three blog posts, I’ll share some of the reactions and implications it’s been stirring up for me. In this learned yet accessible article, co-authors Antonio Spadaro and Marcelo Figueroa (a Roman Catholic and a Presbyterian pastor, both of them respected editors and close friends of the Pope) trace the rise of Protestant Fundamentalism in the early twentieth century, exploring its major doctrinal assertions and detailing its increasing infiltration into American politics. They conclude with a sweeping rejection of these doctrinal claims as antithetical and dangerous to authentic Catholic belief. The article’s “blockbuster” assertion (understandably receiving wide play in the social media) is that there is basically no ideological difference between fundamentalist Christianity and fundamentalist Islam: both draw their juice from an identical “cult of an apocalypse”, featuring a final confrontation between good (“us”) and evil (“them”) which will destroy the planet as we know it and usher in the reign of God. The article represents a significant intellectual milestone and augurs a significant potential wind-shift in Vatican political activism (no doubt this is what has most caught the media’s attention). It is worthy of close study and discussion in our Wisdom circles if folks can get their hands on it (you can still sometimes get in by going directly to the La Civiltà Cattolica website and clicking on the Italian version of the article; an English language option will appear at the end). While there are few surprises here for those already familiar with American religious history, the most welcome surprise is the message clearly being signaled here that the Vatican is finally waking up to the theological implications of this “surprising” alliance that a significant segment of American Catholicism has found increasingly tempting and is now taking a firm intellectual stance against its three constituent threads: the aforementioned “cult of an apocalypse”, the “prosperity gospel” (which has deeply influenced several US presidents including our current one), and a particularly distorted notion of religious liberty which sets the Church in permanent mortal combat with the presumed secularity of the state. The article powerfully calls the question on the present “ecumenism of hate”, as the authors name it, and lays out in contrasting detail Pope Francis’ vision of impartial and active engagement with the secular state in the hopes of securing a sustainable future for all humankind. I applaud their work here because it lays a firm theological foundation for articulating the dangers implicit in the growing entanglement of the Catholic Church in American rightist politics. The article sets out clear standards by which, for example, self-styled über-Catholic Steve Bannon (specifically mentioned in the article) is in fact peddling a dangerously distorted version of Catholic teaching. It lays out clear benchmarks by which Catholics can sort through the confused rhetoric of evangelical fundamentalism and name its widening drift from classic Catholic doctrine. While the authors could have done more to clarify that evangelical fundamentalism represents a perversion of Protestantism as much as of Catholicism (not merely another of Protestantism’s myriad confusing expressions), their analysis is nonetheless a solid intellectual milestone. It is also reflective of the Pope’s strategic way of thinking: his preference for first building a solid theological and historical foundation for reflection and action, rather than simply leaping in with rhetorical or knee-jerk responses. While I am deeply gratified for the breakthrough this article represents, I must say that I find it naïve to expect that it will shift a single stone in the present Catholic/fundamentalist political alliance. Because, in a glaring omission from the presentation, the real basis for this alliance is not fully exposed; hence, the analysis remains incomplete and its practical applicability limited. The article mounts a strong case theologically, but in so doing it manages deftly to sidestep the crucial point: that the real basis for the alliance is not theological but strategic. Nor is this merely a minority viewpoint, to be laid at the doorstep of a small subset of Catholic ultraconservatives; it represents the united “bottom line” of the Roman Catholic Church in America: the vast majority of its bishops, seminaries, and the message percolating into the parishes. The real root of this alliance, I believe, lies in the Roman Catholic Church’s continuing fixation on the abortion issue, together with its lesser but ever present and now vigorously reemerging sidekick, birth control. This is the practical motivation behind the devil’s pact with fundamentalism; if it takes casting one’s lot with a “cult of the apocalypse” to ensure that Roe vs. Wade is legally overturned, well, that’s the unfortunate cost of doing business. It seems unfortunate that in an article otherwise so thorough and scholarly, this rather sizable elephant in the room escapes mention. The article thus creates the impression that all we have to do is wake up to the theological errors inherent in the alliance with Protestant fundamentalism, and Catholics will come streaking back to a more inclusive and life-affirming version of the gospel. Well, maybe. But if you think this translates into any significant flipping of the Catholic vote in 2018, don’t hold your breath. To their credit, I am not sure that from the European (or even South American) perspective, the Vatican can really understand the ferocity of the way in which the abortion issue has enthralled the popular American Catholic imagination. It’s a quintessentially American stew, comprised in equal doses of high principles and sentimentality run amok. 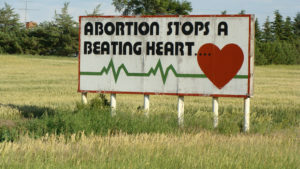 One need only to drive the interstate almost anywhere in the American South or Midwest and see the fully emblazoned billboards with a flat-lining EKG announcing “ABORTION STOPS A BEATING HEART” to begin to appreciate the pungent mix of sentiment and sentimentality that makes this particular issue such a moral flash-point. I personally know many Catholics (in fact, probably the majority of my Catholic acquaintances) who, although good, solid, thoughtful people, not otherwise inclined toward hysteria, feel so strongly that this issue is so essential to their practice of Catholicism – and so underrepresented by any other advocacy group – that they will reluctantly sacrifice the entire rest of the gospel’s “pro- life” teaching (as it might apply to immigrants, Muslims, accessible medical care, gun control, capital punishment) in order to secure this one point. It is this “unholy alliance” that really has provided the undefended back gateway – in fact, sluice-way – by which unethical politicians can continue to occupy their seats in congress, pawns in a game whose real movers and shakers are in fact the Ayn Rand-style kleptocrats (such as Paul Ryan, The Koch brothers, the Trump dynasty) or apocalyptic Armageddon-mongers such as Steve Bannon. My continuing hope – which I have alluded to in articles and posts before – is that our brilliant and committed Pope will move increasingly in the direction of giving issue-specific theological guidance and direction to begin to confront this Gordian knot in a way that is both respectful of Catholic tradition and profoundly responsive to the desperate need of our one planet, trembling on the brink of environmental and social collapse. In the face of this unprecedented global crisis, it is not enough merely to name and proclaim the ways in which the resurgence of Christian fundamentalism represents a perversion of Catholic doctrine. It is not enough merely to repeatedly denounce those currents in American politics fueling radical isolationism and environmental irresponsibility. It is not enough simply to continue to decry the Muslim ban, or lament the moral corruption of our present executive and congressional branches. These stances are all good insofar as they go. But we need to connect the dots. What is really needed – and comprises, I believe, the real Catholic moral priority of our time – is to develop specific guidelines for faithful Catholics detailing how, when push comes to shove, to weigh priorities and difficult trade-offs so that abortion does not become the tail wagging an increasingly rabid and dangerous dog. I am not a moral theologian – or even a Catholic for that matter, so I recognize that I will have no standing in that particular conversation. But as a Christian Wisdom teacher and a concerned planetary citizen, I know that it is important for this conversation to be taking place and for imaginative new thinking to be invited from all quarters. Deliberations on this all-important topic so far left in the hands of the Catholic experts have yielded us no appreciable results; they’ve merely solidified the impasse. This is a human dilemma, and it is as a human family that will solve it. And so I propose here to engage this conversation among our Wisdom Community, asking us all, from our collective data banks of spiritual insight and life expertise, to engage this crucial impasse and see if the act of intelligent conversation can itself generate a bit of third force. Over the next two or three blogs (writing not yet begun but intention herewith signaled) I will attempt, first of all, to lay out a potential pathway toward a new social contract with regard to the abortion issue, a pathway which, though admittedly a compromise, might be one that both Catholics and non-Catholics could live with. In the following, more extended blog, I will reflect on what light the Wisdom tradition has to shed on the beginnings of life and the nature of the soul, both key components in the present gridlock. A good start has been made in this article, and I commend it to you all for deeper study and reflection. 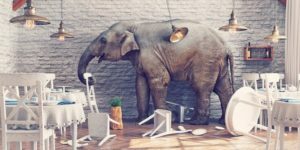 But in accepting its conclusion that joining forces with a distorted Christian fundamentalism is not an option, the next step is to move courageously to confront the “root of the root” of this nefarious allegiance and speak directly of – to – the elephant in the room. Here’s an unusual New Year’s resolution! 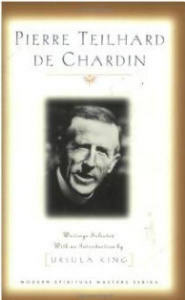 I’d like to propose that all of us in the Wisdom network declare 2015 The Year Of Teilhard de Chardin and take on the collective task of getting to know his work better. There’s no specific milestone to celebrate here. This year will mark the 60th anniversary of his death, but that’s probably looking in the wrong direction. The important thing is that Teilhard’s star is now rising powerfully on the horizon, heralding the dawn of an entirely new kind of Christian theology. Misunderstood in his own times, silenced and exiled by his Jesuit superiors, he is finally coming into his own as the most extraordinary mystical genius of our century and the linchpin connecting scientific cosmology and Christian mystical experience on a dynamic new evolutionary ground. Teilhard is not easy, but there are very good guides out there who will ease the entry shock. 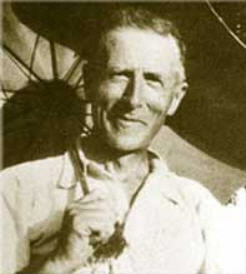 My recommendation is that you begin with Ursula King’s Spirit of Fire: The Life and Vision of Teilhard de Chardin. King is probably the foremost Teilhard scholar of our times, and her very well-written biography gives a good overview of Teilhard’s developing vision and a useful way of keeping track of the chronology of his works. Kathleen Duffy’s Teilhard’s Mysticism is also an insightful introductory guide, introducing the major phases and themes of Teilhard’s work in five expanding “circles.” And of course, for a succinct and clear overview, you can hardly do better than Ilia Delio’s chapter on Teilhard in her Christ in Evolution. ritual Masters series, Orbis Books, 1999). King’s well-chosen selections and helpful introductory commentary will help get you up to speed as painlessly as possible. From there, go to The Heart of Matter, Teilhard’s magnificent spiritual autobiography, written near the end of his life, which offers a moving recapitulation of his lifelong themes as well as a reflection on his earlier work. From there, wander as you will. Those of more devotional temperament will find his The Divine Milieu, Hymn of the Universe, and “The Mass on the World” moving and accessible. Those of more scientific temperament may gravitate toward Christianity and Evolution and The Future of Man. His magnum opus, The Phenomenon of Man, is notoriously challenging, but if you’ve worked your way up to it gradually, you’ll be more able to take it in stride. Most of these volumes are easily available at Amazon.com and other internet websites, and Hymn of the Universe, officially out of print, is available for download. During my upcoming Wisdom Schools this year, I will be intending to “ease in” some Teilhard where appropriate: particularly in our Glastonbury Ascensiontide retreat and our Advanced Wisdom School in North Carolina this April—so if you’re signed up for either of those schools, be sure to get an early jump of the reading trajectory I’ve just laid out. I’ll also be introducing these materials in the some of the “Communities of Practice” sessions in New England later this year, and probably in an official Teilhard Wisdom School in 2016. So be sure to stay tuned. I’m a relative newcomer to Teilhard myself, still working my way through this remarkable corpus like a neophyte spelunker in a vast crystal cave. Not surprisingly, it’s “the kids” in the Wisdom Network—Matthew Wright, Brie Stoner, and Josh Tysinger—who seem to have the best handle on the material and are already grasping its implications for the future (their future!) and unlocking its potential in sermon, song, and drama. I mention this simply to encourage you not to be intimidated by the material, or the apparent lack of an authority figure to interpret it for you. Form a reading group, use your well-patterned lectio divina method to break open a short section of text, and dive in with your energy, your insights, and your questions. How you get there is where you’ll arrive. Okay, who wants to take me up on this New Year’s Challenge?